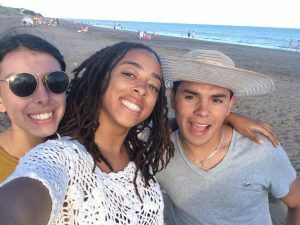 Chisama-Ku Penn, 2016-2017, Fulbright English Teaching Assistant to Argentina (center), posing with friends at Pehuen-Có Beach. Since 2009, nearly 200 Fulbright ETAs, (16% of all RTW volunteer travelers) have completed online journeys with RTW classrooms all over the United States. These grantees truly lived the Fulbright Program’s mission of increasing mutual understanding between the people of the United States and the people of other countries. To date, they have shared more than 3,000 stories from their time abroad for more than 3,400 students. One RTW teacher in Kentucky said, “Students couldn’t believe that there were programs in place that would allow them to travel the world during college and afterwards. 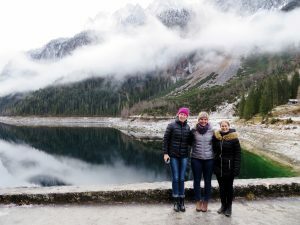 Taking a job overseas has never entered some of their minds.” In embarking on a Reach the World journey with a Fulbright ETA, American students can explore a new part of the world in partnership with an inspiring role model to show that they too can study and travel abroad, just like their volunteer traveler. Kara Witherill, 2015-2016, Fulbright English Teaching Assistant to Germany (center), in Hassfurt with friends at a nearby lake. Reach the World is able to harness original, first-hand stories of exceptional, passionate Fulbrighters in real time and transform them into a dynamic, immersive teaching resource for American educators. Global competence will be essential for the American workforce to face the challenges of the 21st century, and it is partnerships like the one between Reach the World and the Fulbright Program that will ensure America’s youth of today become that global workforce of tomorrow.